Easiest way to save on gas for your car? Lay off the lead foot. 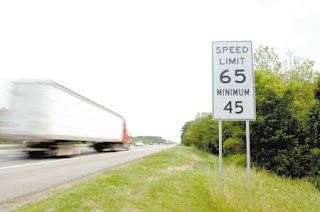 ALBANY, New York (AP) -- As other cars zipped by at 70 mph or more, Mike Papin and his wife, Joann, kept rolling along just below the 65 mph limit as they made their way from their winter home in Florida to a summer place in Vermont. Gas prices are displayed at a station in San Francisco on Monday. They've typically done six or seven miles above the speed limit during the annual migration, but with gasoline prices roaring toward $4 a gallon nationally, Joann suggested they ease off the pedal during the 1,500-mile drive this year. "I read somewhere that around 62 or 63 was the best speed to drive to make the most of your gas," she said. Drivers have known for years that throttling back is a sure way to improve gas mileage, and the Papins are among those who are consciously slowing down to save. Several airlines have adopted the same tactic, adding a few minutes to flights to save millions on fuel. But most drivers still wink at posted speed limits because they say their time is worth more than the gas they'd save by slowing down. Kelley Goodman, an upstate New York therapist, says gas prices haven't yet gone high enough to justify slowing down. "I know it could save some money and I really should. But I'm always running late," Goodman said as she pumped $3.80-a-gallon regular unleaded into her Honda Accord. * Shell exec: To cut price, produce more gas in U.S. Researchers say today's cars are most fuel efficient at speeds between around 30 and 60 mph, and mileage drops sharply at speeds above 65 as engines work harder to overcome wind resistance that rises exponentially. If drivers were forced to slow down -- and lower speed limits were enforced -- the thirst for fuel could be significantly reduced, which could ease prices. Recent surveys show that many drivers have changed their habits to cut fuel costs, but the changes tend to be ones that bring immediate gratification -- such as using the Internet to find stations with the lowest prices and putting less gas in the tank instead of filling up, said Larry Compeau, executive officer of the Society for Consumer Psychology and an associate marketing professor at Clarkson University. "If you buy a more fuel-efficient car or find cheaper gasoline, those things are right in front of you," Compeau said. "Whether you do 65 or 55 is much more nebulous. There's no way for you to immediately see the impact." Based on recent highway traffic volume trends, throttling back to 60 mph from 70 mph would likely reduce gasoline usage between 2 percent and 3 percent, which is about what happened when the 55-mph limit was imposed in the 1970s, said David Greene, a senior researcher at the U.S. Energy Department's Oak Ridge National Lab.